Beneath the shaded graveyard of the Binkley family cemetery is the McMaster Campus Services building. 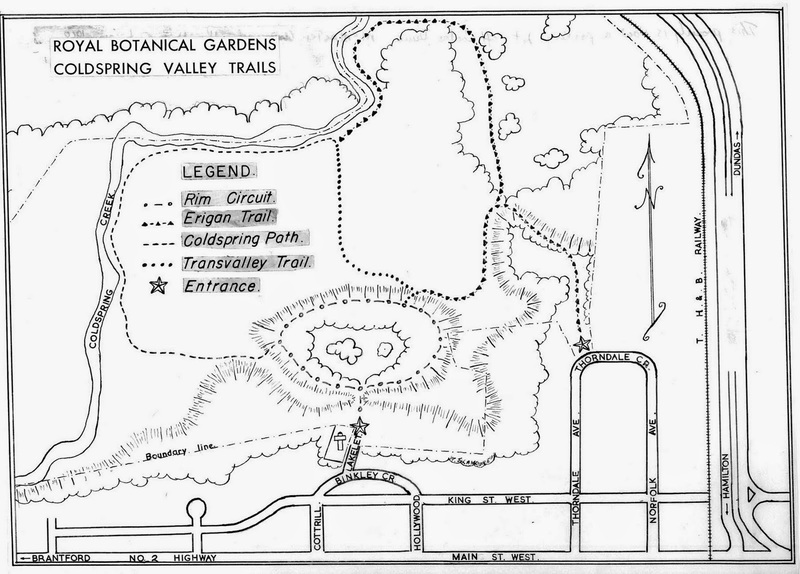 Prior to its construction in the late 1960s, this elevated island of land was the location of the Rim Circuit trail (or AKA Prospect Circuit), part of the Coldspring Valley Nature Sanctuary trails. 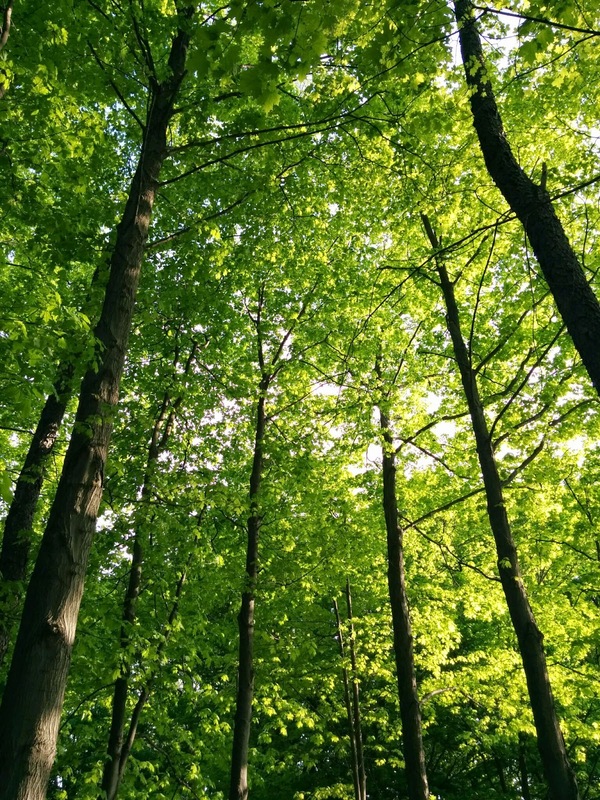 Even today the adjacent hillside offers a beautiful canopy, now in fresh spring green. 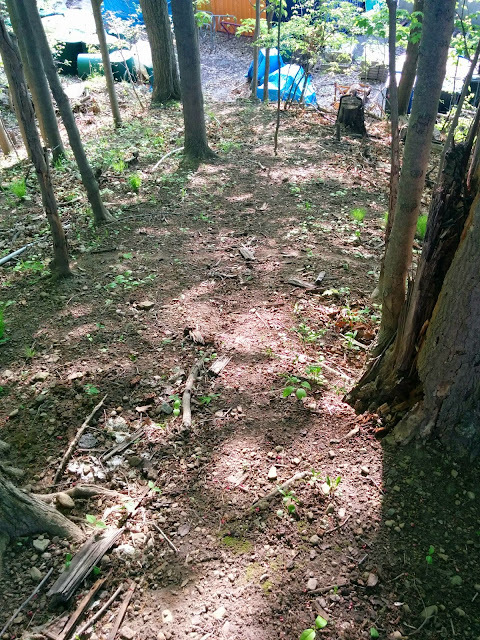 As promised in a previous post, I went back to look for any sign of the former path that once connected the Rim Circuit to the lower Coldspring Path, which is, for all intents and purposes, buried beneath asphalt parking in McMaster's Lot M lot. The path is steep but easily manageable, while other routes are far more sharply angled, making this the best route up or down on foot. It appears that it gets some use even now. There is a work yard below (you can see material at the bottom of the photo) which suggests that some McMaster employees may use the trail to go between the yard and the Campus Services building? Without much dreaming, I can imagine a day in the not too distant future where the lower work yard is moved to a less environmentally sensitive area, allowing a rehabilitation project already underway in the adjacent hillside and parking area to the west to expand to include the yard property. 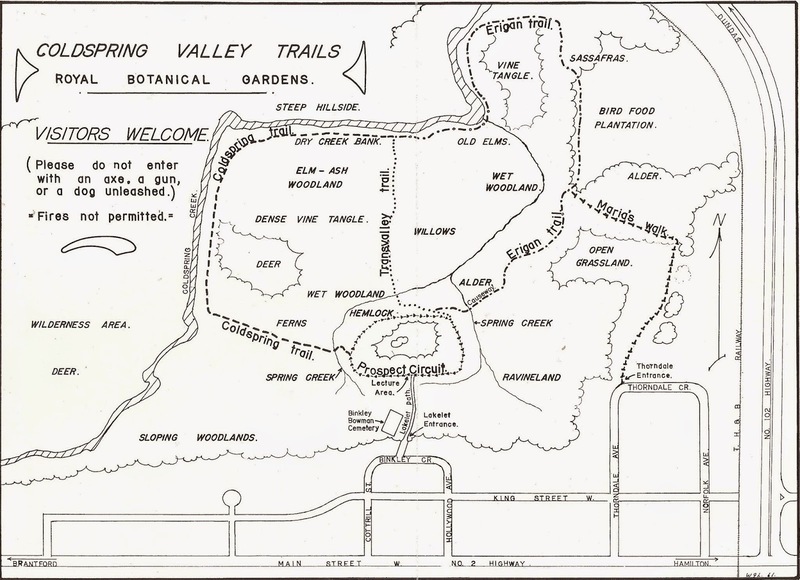 Two RBG maps of the Coldspring Valley trails. Until now I hadn't quite realized the differences between them. 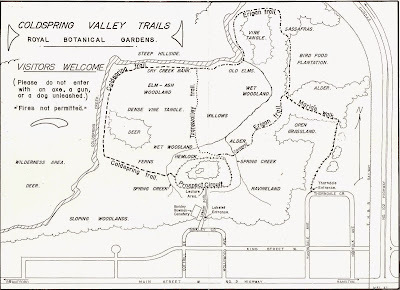 Maria's Walk does not get named in the first map though the route is marked from the Thorndale entrance. Also, in the second map, Rim Circuit has been renamed Prospect Circuit. 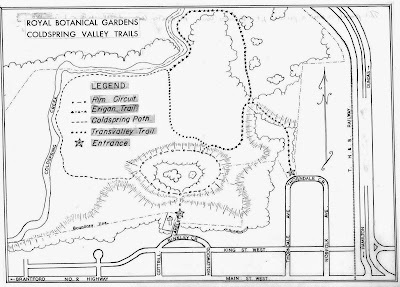 Maria's Walk appears as a distinct trail, separate from Erigan Trail. Now I have to go back into my research notes to get the dates of these two maps, to confirm the chronology.